The UK media must not help terrorists by showing "harmful" content in their coverage of incidents, Britain's most senior counter-terrorism officer says. Neil Basu said a "sensible conversation" was needed about how incidents like the Christchurch attack should be reported. Several UK newspaper websites used film taken by suspected gunman or posted links to his so-called "manifesto". Mr Basu said it was wrong to "hide behind the mantra" of free speech. 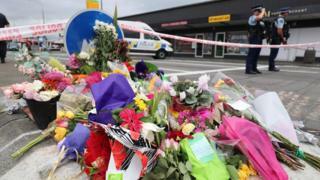 The attacks in Christchurch on Friday, the deadliest in New Zealand's history, happened as people were attending prayers at two mosques. Social media companies like YouTube and Facebook raced to take the footage down, but it was still published on the front pages of some of the world's biggest news websites - including in the UK and Australia - in the form of still images, gifs, and even the full video. The Mirror's editor, Lloyd Embley, later apologised, explaining in a tweet the film should not have been carried as it was not in line with its policy relating to terrorist propaganda videos. MailOnline did eventually remove a link to the alleged gunman's document from its site, and released a statement saying it was "an error". Neil Basu's open letter will inevitably stir up a debate about where the balance lies between freedom of speech and national security. And that is clearly what he wants. His frustration about the mainstream media's coverage of the New Zealand gun attack, and terrorism more broadly, seeps from the page. It strongly suggests that the Met Assistant Commissioner has seen compelling evidence of the impact of such reporting, as opposed to a theoretical concern. Nevertheless, criticising newspapers in the way he has runs the risk of losing support among those who are well placed to convey important police messages. Mr Basu clearly believes that's a risk worth taking. Assistant Commissioner Basu's open letter said it was "time to have a sensible conversation about how to report terrorism in a way that doesn't help terrorists". He said the same media organisations who have criticised social media platforms for not acting fast enough to remove extremist content have published "uncensored propaganda" of the Islamic State or made the "rambling 'manifestos' of crazed killers available for download". Freedom of speech "is not an absolute right, it is not the freedom to cause harm", Mr Basu said. Urging editors to debate the issue with survivors of terrorism and police, Mr Basu added: "Anyone who seeks to deny the negative effects that promoting terrorist propaganda can have, should think carefully about the massive global effort to remove terrorist content from social media platforms and the pressure that governments, law enforcement and, ironically, the mass media has put on those companies to cleanse their sites." "We must recognise this as harmful to our society and security," he said. New Zealand Prime Minister Jacinda Ardern has vowed never to say the name of the Christchurch mosque gunman because she refused to give him the "notoriety" he sought.